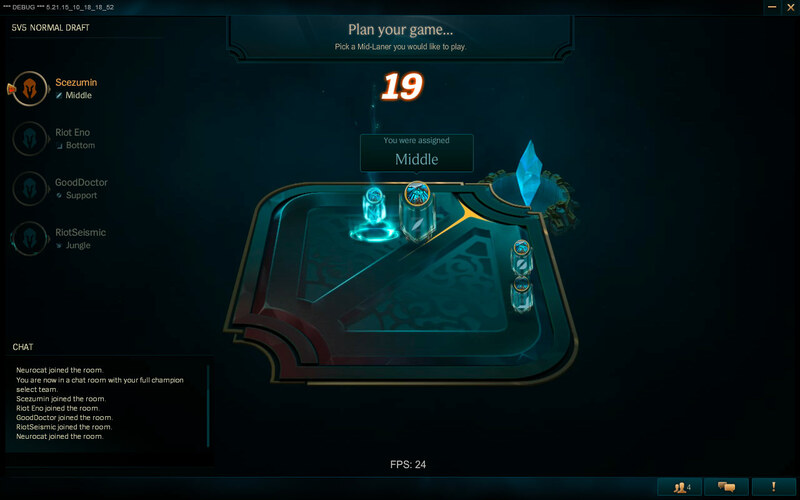 TLDR: When new champ select goes live in your region, it will replace the Team Builder queue. Since introducing the experimental Team Builder queue back in 2013, weâ€™ve been analyzing and rethinking the best way to get into a game of League. The lessons we learned from the Team Builder queue directly impacted the development of new champ select. Weâ€™d originally planned to adopt Team Builder across all queues, but as our first attempt at improving the experience of starting a League match, a few issues held us back. While Team Builder successfully empowered individual players to choose the champ they wanted in the role they wanted each time, it wasnâ€™t as good at helping teams assemble a specific strategy or composition. Building a Yasuo-based knock-up comp or a classic Orianna-oriented wombo combo was damn hard when non-premade players pre-selected their champs. Long queue times made turning down champions that didnâ€™t fit while waiting for your teamâ€™s missing piece feel even worse. 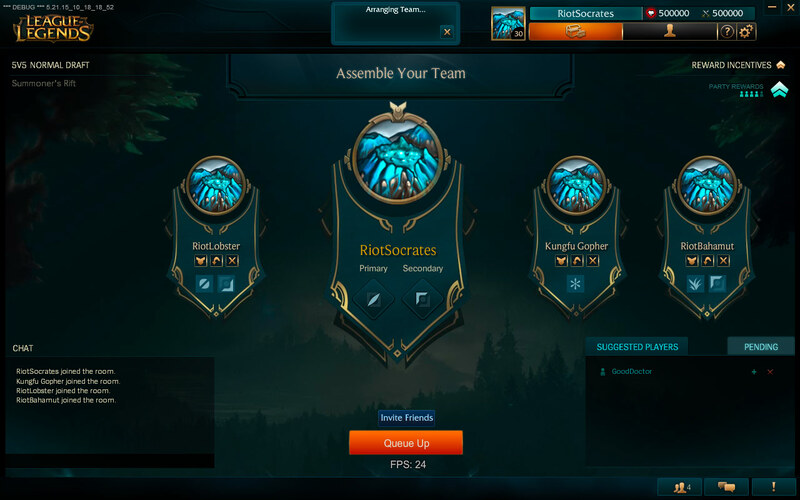 With new champ select, weâ€™ve solved the issues we found with Team Builder. Teams get on the same page and start working together through pick intent and distributed bans right from the start. Youâ€™re guaranteed to get one of the two positions you prefer, and you can use pick intent to let your team know who youâ€™re looking to play before bans and picks take place. 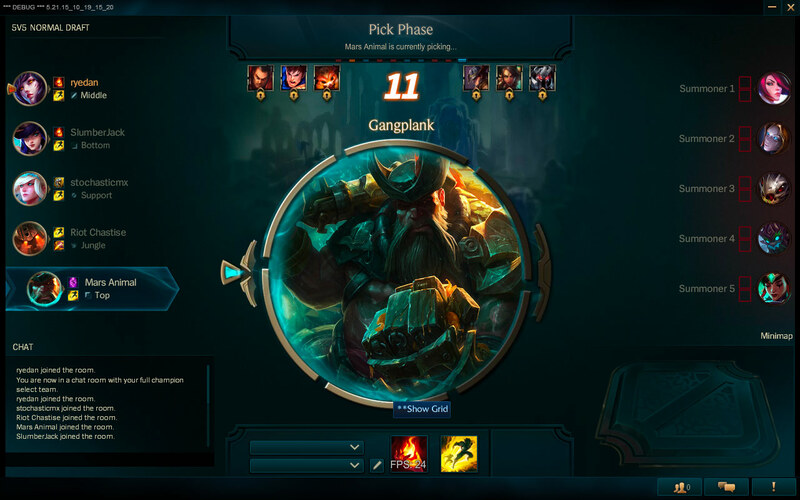 We ultimately decided to disable the Team Builder queue because we believe new champ select is a better answer to many of the problems we were trying to solve with Team Builder, and in the future weâ€™ll introduce a version of blind pick inspired by the new design for players who are looking for the new champ select experience without bans or drafting. New champ select goes live in NA & TR for testing in Normal Draft and Ranked on January 13, 2016. If everything goes well, weâ€™ll continue to roll out new champ select in other territories over the following days. Thanks to everyone who gave us feedback along the way to this launch, from the original Team Builder beta to the recent PBE testing. Weâ€™re excited to take this next step into Leagueâ€™s future, and we canâ€™t wait to join you in new champ select. 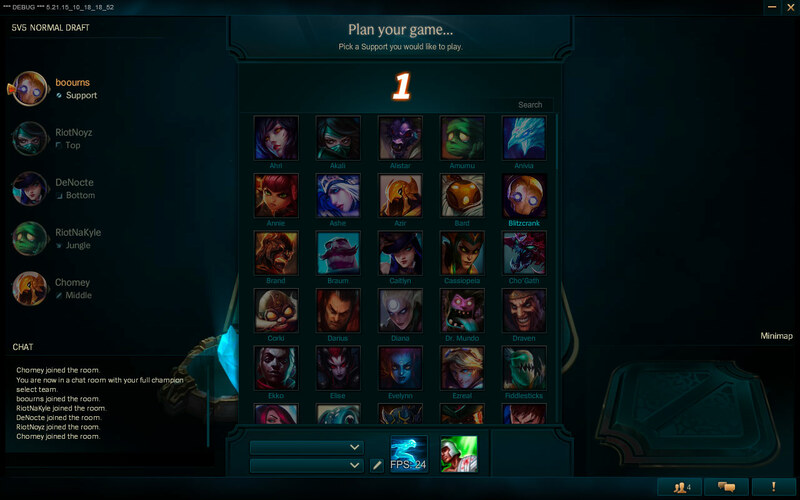 [ Note ] You can find a preview of the new Champion Select on the PBE HERE. Lyte here. Last week we shared the new champ select for the first time. For the next couple of hours, the design team behind the feature will be here to answer all your champ select questions. Daniel â€œryedanâ€ Balmert, Kam â€œboournsâ€ Fung, and Eric â€œSocratesâ€ Kenna. Come ask us anything you want about the design, the visuals, or experience of the new champ select! EDIT ::: Team’s going to grab some lunch! May drop by here and there to answer some remaining questions. Thanks for stopping by! We’re planning some deep dives and behind the scenes looks at the building of the new Champ Select, and our initial testing was actually with these ugly (sorry boourns!) prototypes that just had grey boxes and words. This is called UX lab testing in the games industry, and allows design teams to focus feedback and testing on the actual functional experience of the system and not be distracted by the polish of fancy visuals or animations. It’s only until pretty far in the project until you start adding in the stuff that makes the system look like magic. Bans are important. In the live version of Draft, the captain has the opportunity to use 3 bans to troll his teammates. Each ban used to “troll” allies means that some dangerous, high value champ is left on the table. The distribution of bans makes it so when you DO have someone trolling, their power is contained to a single ban. Actually, we saw something pretty weird in our playtests with Distributed Bans and Pick Intent. Because every single player now has a powerful “choice” in Champ Select (whether it’s a ban, or the top 2 picks), it actually reduced trolling of Pick Intent. So basically, players were far less likely to ban a Pick Intent (unless they thought it was a S-tier champion or something) because they knew that if they pissed off their teammates, their teammates could reverse-troll them with their powerful choice. If you’re super worried about trolling in Pick Intent either way, you can always let the timer run out and not choose any champs at all and display a blank helmet icon. One of our goals with the new champ select was to formalize a lot of communication to make it easier to get on the same page with your team quickly. Ultimately we believe this will let players focus on strategy instead of just trying to figure out positions. We’d like to do some pre-season testing on NA and TR first, and if things are going well, we’ll rapidly roll it out globally. We see this question a lot, so going to jump in even though it’s late in the thread. When we choose to test new systems and features, it has everything to do with timezone. Although some teams work in multiple offices around the world, 100% of our team works in the LA office which means we prefer to choose a test server that has a timezone that does NOTcompletely wreck our sleep schedules. You generally want to turn on a new feature or system during off-peak hours, say 6 AM, and then monitor it for about 24 hours at a time. By choosing NA, we can basically wake up and sleep at an OK time which is far less exhausting for the team. I felt the same way with the old experience, Drafting can feel like it takes a long time and we definitely didn’t want to make it take longer. In our testing so far we’ve seen champ selects move slightly faster. The biggest change that impacts this is requiring champion selections to be locked in instead of it being possible to idle on a champ selection and have it auto lock at the end. The above is subject to changes based on testing. We expect that the new champion select experience will greatly reduce these kinds of situations. We’re going to look at our metrics after release and see if there’s value in attacking the problem more. That said, we don’t think vote kick is a great way to solve the problem. If we do work around negative champion select behavior it will be more around reporting that behavior after you dodge. Vote kick just has too many negative side effects (it may actually increase bullying of off-meta champion picks for example). It’s always a cost vs benefit issue, but we’re willing to look at the benefit. Something we’ve kicked around is having your top X (5?) played champions stickied to the top of the champion grid (for easy access). We want to use something smart that doesn’t require management, otherwise it’s unlikely to get adopted (and therefore deliver any value) to many players. Item sets are great for power users, but we didn’t see as much use as we thought. It’s great for those couple of people that really use it, but we could have brought something much more useful to more players. This is something we’re looking at adding, although I don’t know if it will be in the initial release. Personally I’d love to be able to bring the champion grid back up during picks and bans so I can convey up-to-date information to my team. No, we’ve intentionally removed the ability to let the timer run out to lock in a Pick, or skip a Ban. When you’re in a team with strangers, skipping a ban is a confusing and frustrating experience for the rest of the team (and they often misunderstand it as the Captain being AFK). If you really want the challenge of skipping bans, grab 4 friends and join Dynamic Queue as a Premade of 5 and ban random champions. To be honest, we’re not sure when we’re going to go live yet. We have some polish we’d like to do, maybe a new feature or two, and have one nasty bug we need to fix before the Ranked 2016 Season. The team would love to do another PBE test, and potentially a roll out to NA and TR before the Ranked 2016 Season begins to iron out any further kinks, but we’re working around the clock right now and it’s hard to predict when each of these pieces will finish. Right now, there are no plans to allow everyone to see your Champion Mastery in Champ Select. We may re-visit this in the future though, and would just have to balance out the negative behaviors that were created. For example, in a distant future when we have more than 5 levels of Champion Mastery, maybe we only show Champion Mastery only when you are Level 10 or higher–this is a significant investment, and something “cool” to show you’re a master with a champion. However, Level 10 might be a lofty, challenging goal. If we decided to show, say Level 2 Champ Mastery or higher, it would create an immediate perception that if you WEREN’T showing Champ Mastery with a champ, that you shouldn’t play Ranked at all. We’re aware some players would love this type of “gate” on who you can play in Ranked, but it’s not something we’re going to consider today because there are more important issues to improve in Ranked Mode. Yes! This is a feature we’re still working on, but didn’t finish by the first PBE release. boourns remembers the crazy testing we had to do with Distributed Bans. At the beginning, we actually had Players 1, 2, 3, get the bans, then Players 4 and 5 get 1st and 2nd pick. However, this was super confusing to players in the testing because they already had yearsof prior experience of picks “starting” from the top of the team. So, we swapped it the current format where Players 3, 4, 5 get the bans, then we “reset” into Pick Phase and start from the top. This was much clearer for current players of the game, so we stuck with it. This is a tricky situation. Your summoner icon isn’t really shown in champ select (unless you count the load screen). Let’s be honest – as your ally, I care more about what you’re playing than what your icon is in champ select. Now, being able to choose icons, ward skins, skins, chromas, finishers etc. all together AFTER I’ve selected my champion is a feature set we’re considering. When we started this project, we always felt like this was the “end-game” of Team Builder. We’re actually considering closing down the old Team Builder queue, and slowly replacing many of the queues with this new Champ Select experience. So, the Ranked 2016 Season will just have this new Champ Select experience as its queue, and in the future, Normal Draft will just be this new Champ Select experience. All the testing so far has suggested that the new Champ Select is the best possible League experience, so we’re considering sunsetting the old Team Builder. We’d also like to replace some of the other queue experiences (like Normal Draft and Ranked) with this new Champ Select experience. The design of the new champion select experience is specifically aimed at reducing conflict in champion select, we think that setting the right environment up for cooperation and communication is the best safeguard against toxic champion select behavior. Your specific example is incredibly rare, even right now, and if it’s a pattern of behavior that player will already be punished by existing systems. That said we have some designs in our backlog for reporting pre-game toxicity. We’re going to see how negative behavior in champion select looks after release and decide if it’s valuable to do something like pre-game reports (we’re hoping there will be so little it won’t be necessary). One other reason is because it would make it harder for fresh level 30s to transition into ranked. You need to own 10 (# players in game) + 6 (# of bans) champions. Newer players would be forced to unlock 20 total champions (instead of 16), which might deter more people from trying it. That’s in addition to the other diversity reasons. There’s no such thing as “not ready for ranked” as far as skill. The spectrum of Bronze to Challenger covers everyone. The reason we have the level 30 cap is to make sure you’re not playing against people who have access to raw stat advantages over you. I don’t know what the plans are regarding increasing the ban count, but it’s a heavy issue. If you could ban 5 chess pieces, we’d have all pawns. On the flip side, zero bans means that the absolute best options will be picked 100% of the time, leading to stagnation in picks (first pick always gets queen). You need to maintain a comfortable amount of bans that permits something powerful left on the board, while still allowing the player-base to deny commonly accepted “OP” picks. You need fewer bans than “must picks” in order for bans to mean anything, otherwise it’s just a false choice. We prioritize matching the same size groups against each other. It may happen that a premade 5 gets matched against solos, but it should be very rare based on our simulations using live data. We’ll know more when we look at real matches post release. If it’s happening too often we’ll take measures to make sure we’re getting fair matches. I like the idea in principal – both sides still get the same ban # and everyone is happy. However, I think this goes against one of our pillars when re-designing the champion select screen – Clarity on what’s happening now and who’s going next. If people can pass on bans, shuffle them down and move actions around, it gets hard for someone to understand what’s going on. For example, who gets your ban? how many seconds do you have to discard your ban? If a person thinks they aren’t banning then suddenly they are “granted” a ban, it might be weird. If you don’t know who to ban or don’t care, ban Yorick. It will make Lyte mad because he likes to play him. This is a pretty common misunderstanding in Ranked play today. On average, players are only proficient at about 2.2 positions today. In fact, as you go higher in skill, you become more specialized in particular positions. However, we have some ideas to actually encourage players to master multiple positions beyond 2, and potentially reward players for truly being a master of all positions in League. If you’re in a premade party the system prevents this. You must have party size + 1 unique positions selected. So if you’re duo you can’t go bot/supp, supp/bot. Instead you must have one more unique position. If you’re soloing the system will prefer to give you your primary choice when possible. We wouldn’t do pick order based on your position because it would betray to the other team where each champion was going. This was something we looked at earlier, but didn’t do because part of the strategic fun of draft is being able to fake out the other team with a flex pick like lulu. By having assigned positions we already think it will be likely that you will get the champion you want even if you’re last pick. BTW last pick also has power because it allows you to counter-pick your lane matchup. Regarding loading screen chat: you’re not the only one who would love that feature! It’s difficult to do because, frankly, there’s not a lot loaded in the loading screen (including chat)! 😀 There are no shortage of people here who would love to see it happen, it just hasn’t so far. Break out your best champs in your favorite roles. With new champ select, everyone is on the same page before the draft even begins. Each player chooses two positions (or fill!) before queueing up to find a team. A new feature, â€œpick intentâ€, helps everyone understand the champ you want to play and the contribution you want to make to your team’s comp. With the draft underway, a new ban phase distributes one ban each to the players who receive the last three picks, while the top two have a shot at securing priority champs for the team. Put simply: champ select should leave every teammate – and every team – better placed to smash the enemy nexus. You now select two positions out of top, jungle, mid, bottom, support, and fill. Requiring two positions ensures short queue times and that no one gets stuck in a position they don’t want to play. Everyone learns where they’re headed at the same time. Team chat appears here, helping the team get on the same page. We’re distributing drafting responsibilities amongst all players. A new ban phase distributes one ban each to the players who receive the last three picks, while the top two have a shot at securing priority champs for the team. For clarity: bans still happen before picks. Friends understand each other’s intentions and set each other up for success. 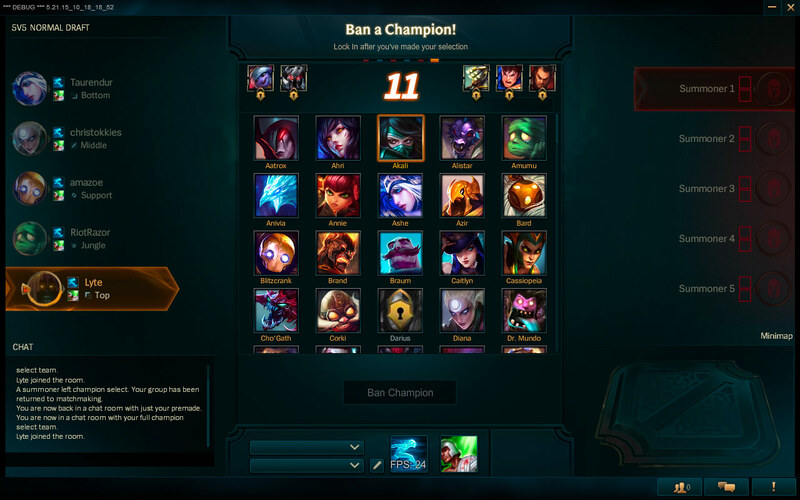 This idea is key to champ select’s new design.The new champ select helps strangers cooperate so every player plays from a position of strength, understands their teammates, and makes their best possible contribution to a win. Requiring two positions ensures short queue times and that no one on your team gets stuck in a position they don’t want to play. We know some options (*cough* support and jungle) aren’t always quite as popular, and plan to incentivize these roles with IP bonuses if necessary. We don’t see position select impeding lane swaps or other emergent strategies in the future, and teams remain totally free to collaborate and experiment with different comps (double jungle 2016)! After your match is made, you and your new teammates discover your position and enter the draft. Before the ban phase begins, everyone picks the champ they plan to playâ€”this is called pick intent. Pick intent helps your team sort out potential comps and avoid teammate-harming bans. We’re distributing drafting responsibilities amongst all players so every player gets a chance to make a meaningful contribution to their team. A new ban phase distributes one ban each to the players who receive the last three picks, while the top two have a shot at securing priority champs for the team. For clarity: bans still happen before picks. New champ select hits PBE first, and will go live in normal draft during an upcoming patch. We’ll keep you posted on all queue changes as they approach, and we’re excited to hear your feedback!